Back in the old West, they called the bathroom or toilet the “necessary” for obvious reasons. What’s necessary in a 21st century Cape Cod bathroom goes beyond a commode and shower. Many Cape Cod homeowners look at the bathroom as an escape, their own private spa. And what is necessary in a bathroom remodel Cape Cod style goes far beyond what would suffice in the Old West. At Moniz Home Improvement, we understand what’s necessary for a bathroom remodel Cape Cod style. Creating your domestic oasis can include any or all these components—showers, tubs, vanities, sinks, counters, and flooring. And let’s not forget other elements of a bathroom remodel Cape Cod style that play just as big of a part in creating a relaxing environment. Things like wood work and lighting, mirrors and the right paint or wallpaper. What goes in to a bathroom remodel design? Who will be using the bathroom? – You might not want that walk-in shower for the kids’ bathroom but it certainly would be appealing in the master bath. Budget – A complete bathroom remodel, Cape Cod style can cost a pretty penny. We can show you what your budget can do. Tastes – A couple may agree on a bathroom remodel, but maybe not a bathroom remodel in a Cape Cod style. Perhaps one person wants a different look or style. Moniz Home Improvement won’t settle domestic disputes but we can provide options. Moniz Home Improvement will perform an assessment of your current bathroom or bathrooms and then have a sit-down discussion about what you might want to do. As with kitchen remodels and the other work we do, we’ll take in your thoughts, share ours, and help you work towards a final design. We’ll then create a plan so you have a better idea of what your bathroom will look like and how it will function in terms of flow and space (a dream bathroom still needs space for storage of towels, cleaning materials and personal toiletries). In terms of the pieces for your bath, we work with many suppliers of bathroom fixtures and accessories who can help. If you have your own sources, that’s fine, too. We can work with them as well and will happily do so if it gets you the bathroom you want. 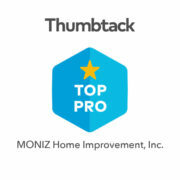 Moniz Home Improvement is licensed and insured, as are the contractors we work with. We are extremely particular about the contractors we work with. We value dependability every bit as much as capability. It’s our good name that goes out to every job site and we only work with professionals who value our reputation as much as we do. There’s nothing like a hot soak in a tub with Jacuzzi jets to soothe your body after a long day on the job or out having fun. And if you’re not a tub person, imagine a walk-in shower with ceiling shower head with targeted jets sprays on the walls to target sore, aching muscles. While these features may seem like extras, after having them for a while you will see them as a necessary. Maybe not like the old west, but definitely like a Cape Cod bathroom. To start on the path to your dream bathroom, give us a call at 774-237-0317 or drop us a line to start the conversation.